Bear loves buses, I mean he really, really loves buses. 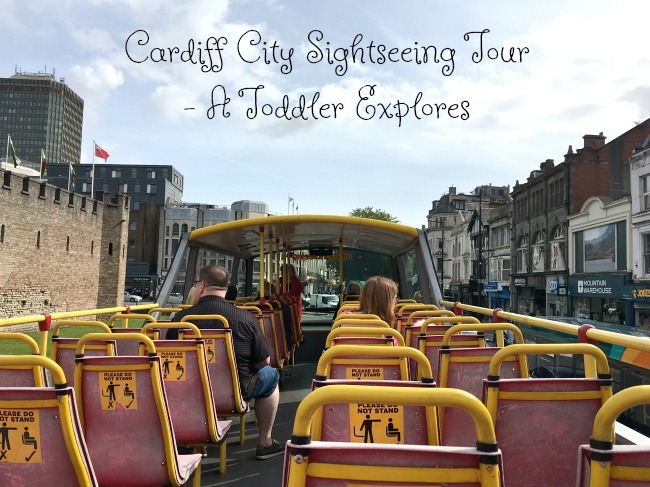 We often catch the bus into Cardiff City Centre just for the bus ride. 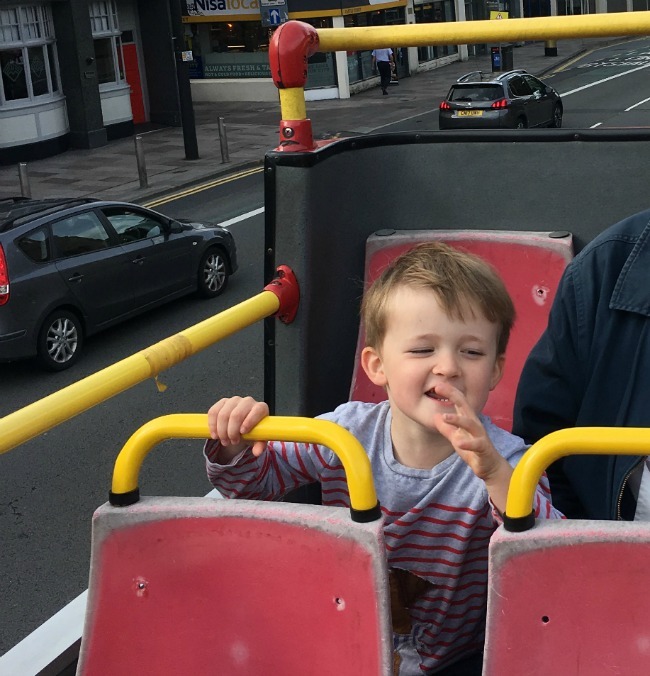 So for ages we have wanted to take him on an open topped bus tour of Cardiff. At the moment we only have Bear two days a week and we have been waiting for some dry weather on one of those days. Today the forecast was dry so we caught the bus into town, and then caught the tour bus. It leaves from outside Cardiff Castle on the hour and thirty minutes past. 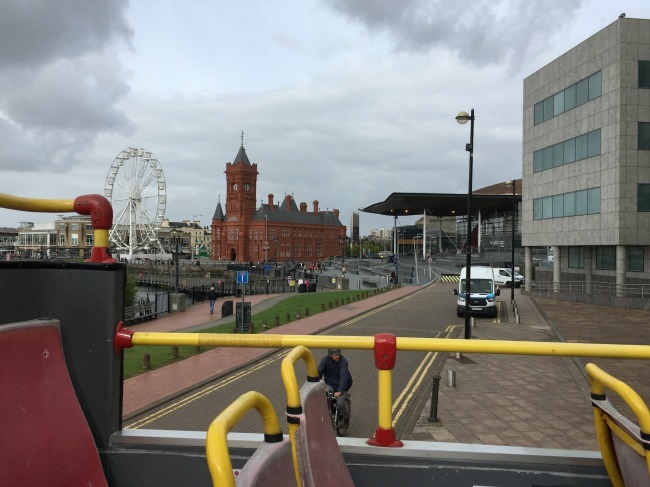 It is a hop on - hop off and the ticket lasts two days, so although it may seem expensive, if you are staying in Cardiff for a couple of days you can really get your moneys worth. Bear was so excited! I was a little nervous being on the top with no walls or roof but he was so good and sat still all the way around. The whole journey takes about an hour. A happy Bear, a police van had just stopped next to us and the policeman waved. He even rolled down his window and talked to Bear. Bear was so pleased. Cardiff is such a friendly city. So why take a tour bus and not just hop on the Bay Car? Because the tour bus has no roof! It is amazing, Bear loved the wind in his face and we saw so much detail on the buildings. You just can't get that on a single decker (Bay Car buses are all single deckers). Also without the roof you can look up, oh and the tour guide was so good. 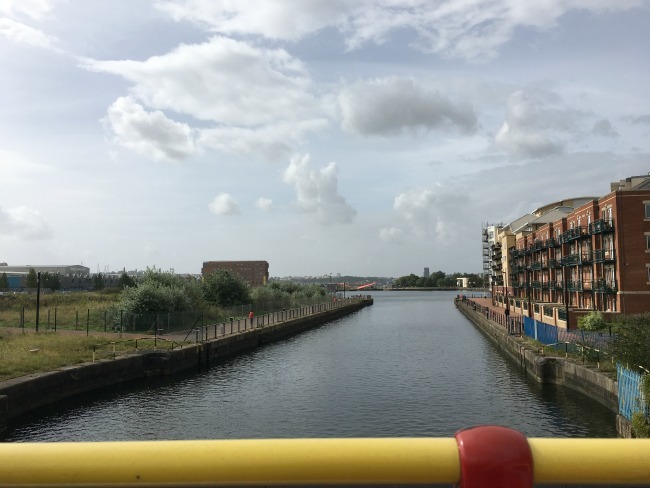 I have lived in Cardiff for over forty years and I learnt so much. 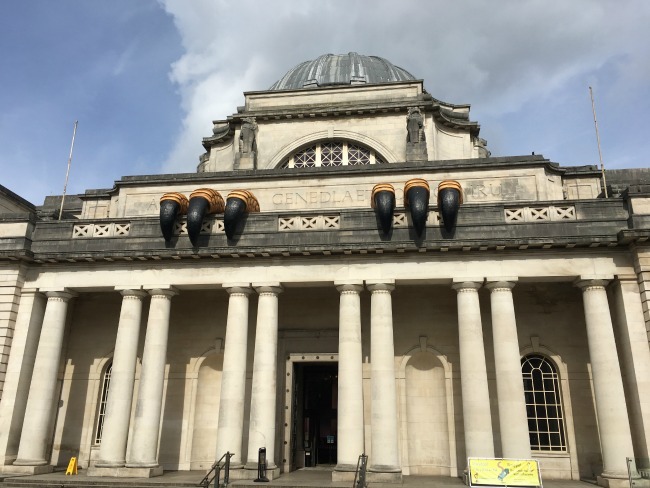 The National Museum of Wales - Cardiff has many dragons, and a few dinosaurs too. 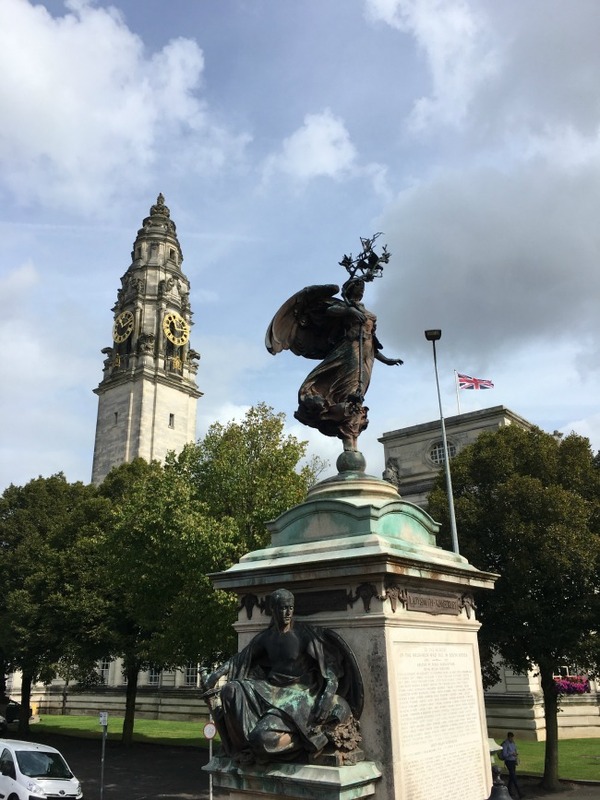 The Boer war memorial, so beautiful and a view you just do not get from street level. 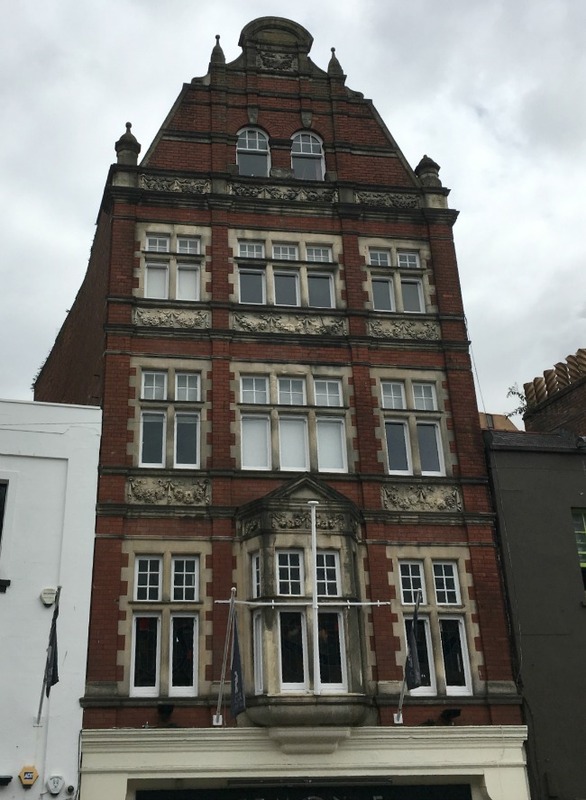 I have always known this building on Newport Road as an university building. I didn't know it was the city's first infirmary and built outside the city centre to prevent spread of disease. It started out a lovely sunny day then the clouds came over but it didn't rain and we didn't get too cold. I would suggest taking a warm coat or blanket if you are doing it later in the year. The bus leaves from the Castle, travels around the civic buildings and down to the Bay. It circles the Bay and back. There are stops all along the way and each stop is a request stop, you can get off (or on) at any stop on the route. 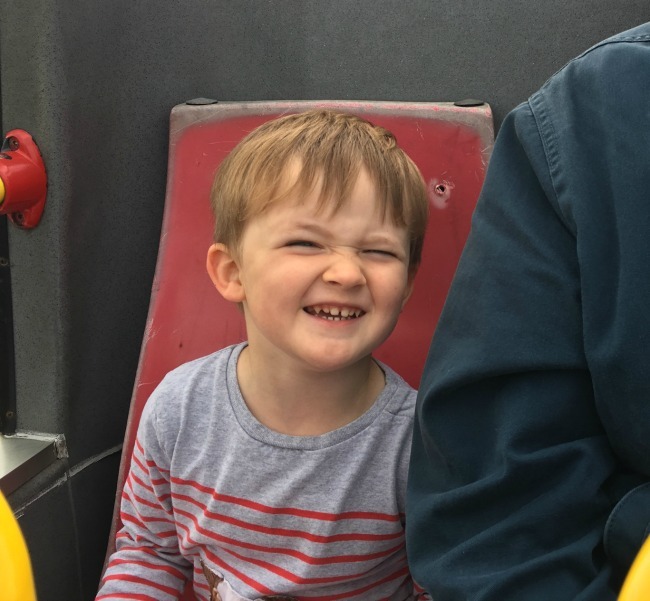 We had promised Bear a Happy Meal from McDonalds so we stayed on the bus all the way around but it could be a whole day out, getting on and off and seeing each place up close. It stays near to the city centre so even if you missed the last bus there are regular local buses running back to the city centre. Here are some of the many photos I took just to give a flavour of our wonderful city. 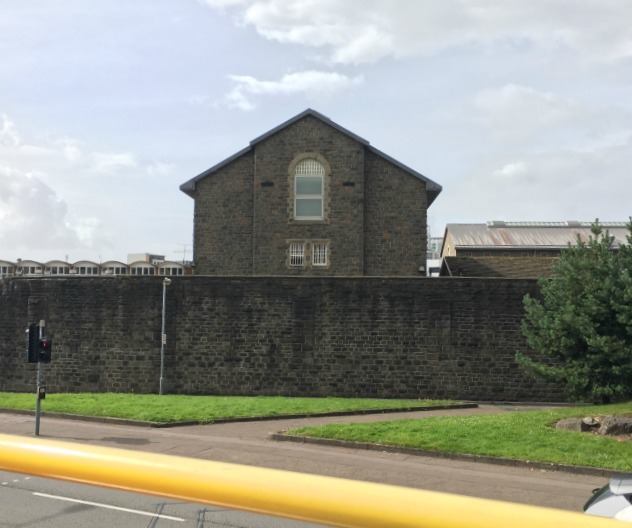 Cardiff Prison. 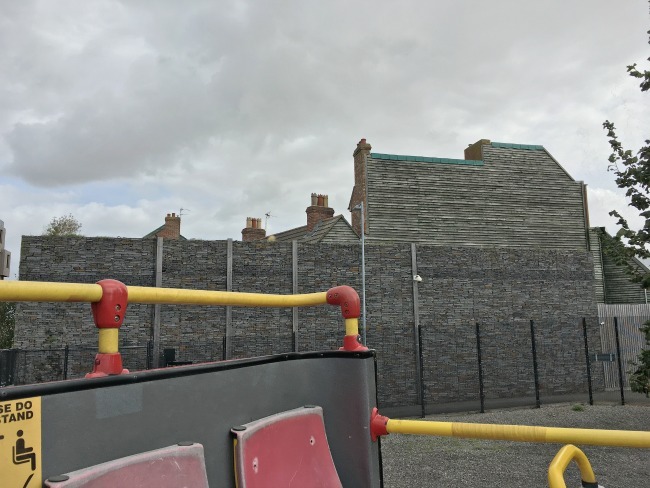 When built this building held 70 prisoners, now it holds 700. There is also an acclaimed restaurant here - The Clink. 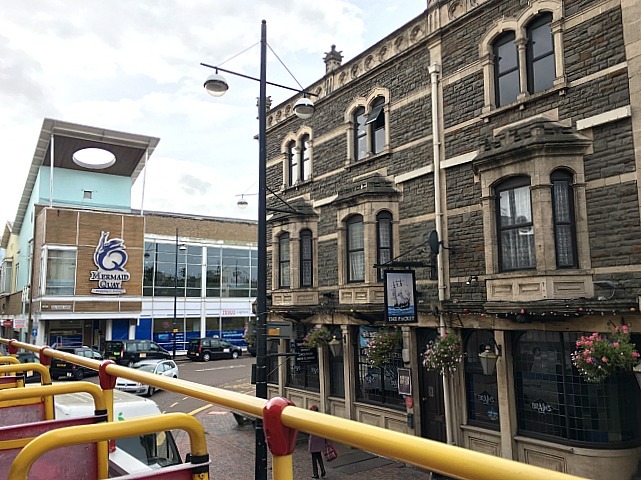 Cardiff was a rich town. The first one million pound cheque was signed in Cardiff. There were more millionaires in Cardiff than any other city in the world. Coal made Cardiff rich. 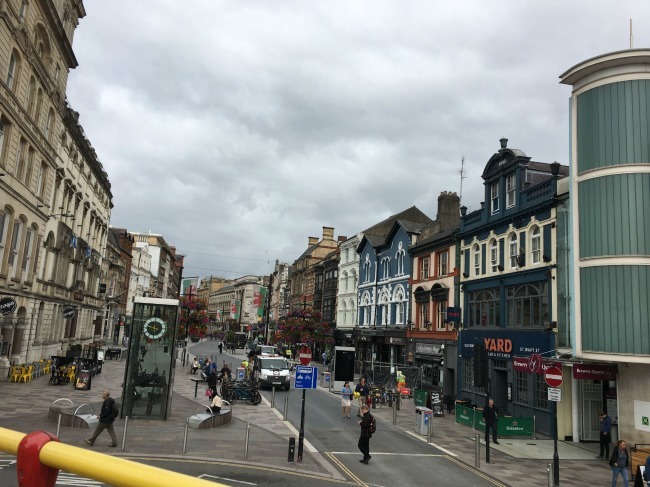 We were told about the areas of Cardiff we passed through - New Town, where the Irish settled when they fled Ireland during the Potato Famine. They came here, the men worked building the docks and the women and children, ironically, packed potatoes in the warehouses for export. Temperance Town, an area around Wood Street. Residents had to pledge to live alcohol free to be allowed to live here. 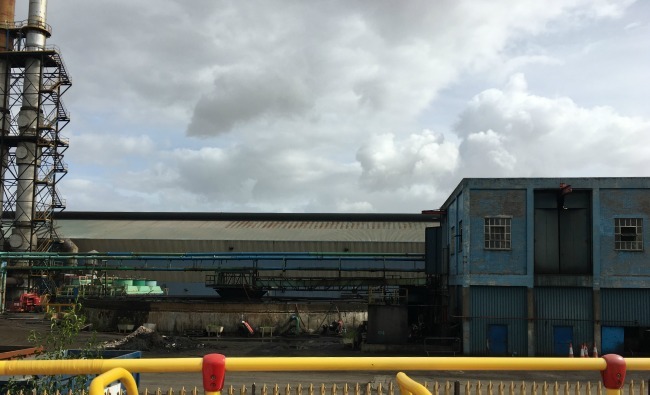 The last of our heavy industry. All the steel works have gone, the mines closed. This makes steel wire and imports coal. 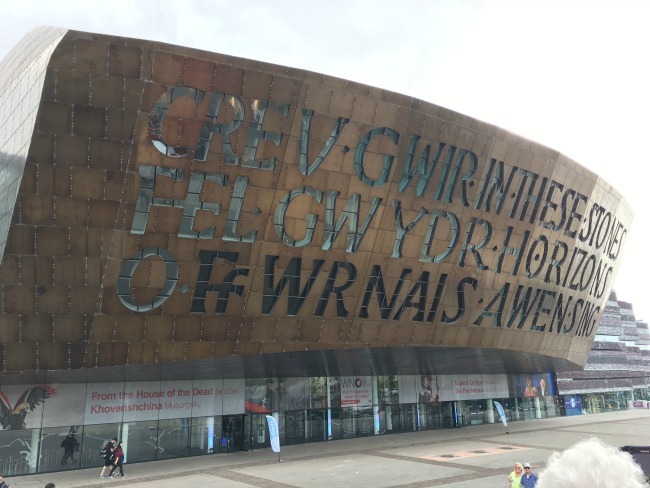 The beautiful Millennium centre, built with Welsh slate and wood. The view from the top of the bus is wonderful. The view across the bay. 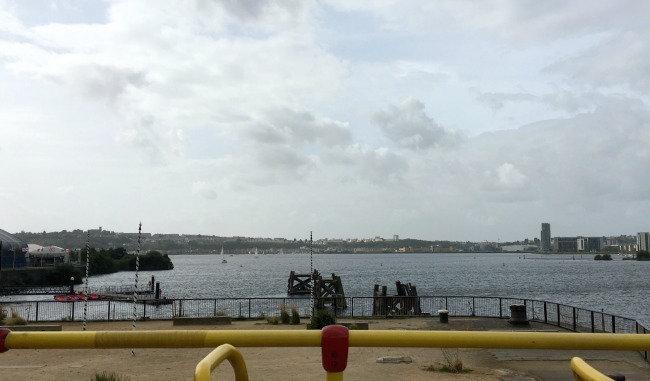 this used to be tidal but the building of the barrage makes this a lagoon that is used for leisure sports. I have swum here....OK I was supposed to be sailing and capsized but how many can say that? 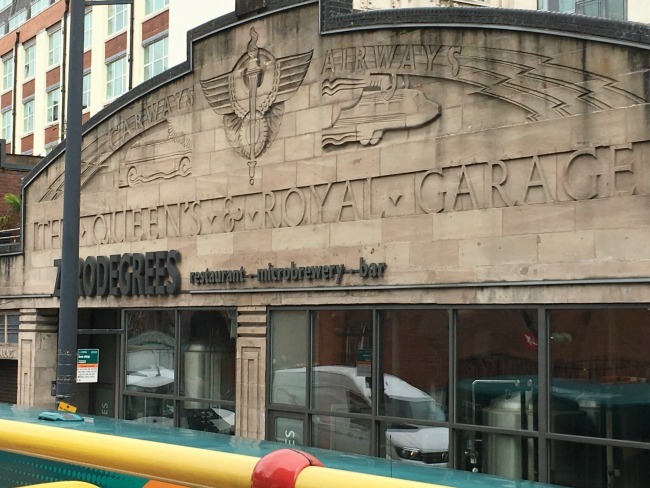 There are some beautiful old buildings in Cardiff and old pubs too. The Packet was built in 1864. 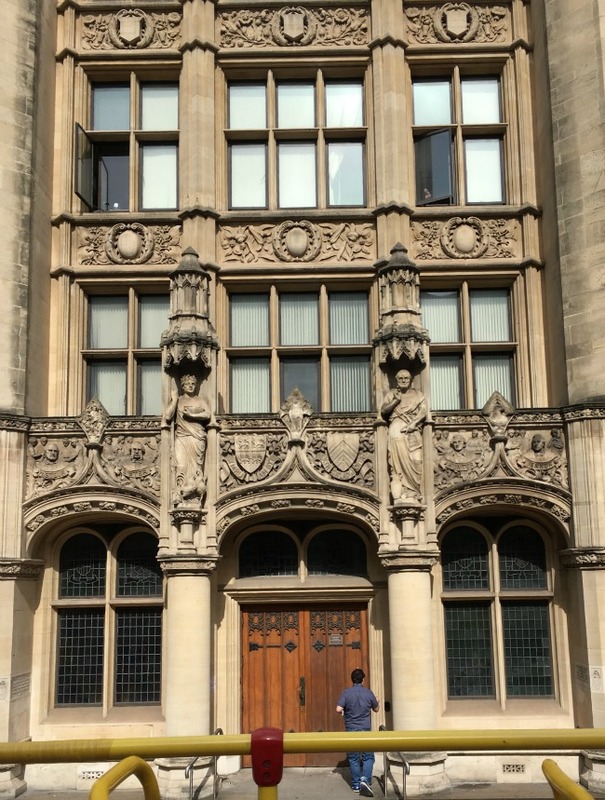 Many of the most beautiful buildings in Cardiff City Centre are "hidden". They are there for you to see if you look up and stretch your neck! On the top deck of a tour bus these are almost at eye level and the detail is amazing. 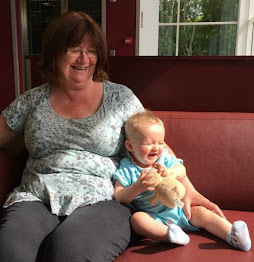 This is part of my A Toddler Explores series, so did Bear enjoy it? Oh yes! He loved it. It was just the right length so he didn't get bored, but he loves just being on a bus. It took a thirty minute bus ride to get to the castle and the same home. A perfect day out. We bought our own tickets and had no incentive to write this review, we just loved it and wanted to share it with you. We bought our tickets on the bus, it cost us £19 (two senior citizen tickets and Bear went free). Up to date prices, timetable and so on can be found on the City Sightseeing website.